Slavery in the South was a dark chapter in American history. Yet in this desperate time, a shining light of hope emerged from the darkness-the Underground Railroad! The Underground Railroad was not powered by noisy, dirty steam engines, but by the hearts, minds, and hands of Americans. This network of courageous men and women, safe houses, and secret messages moved close to 100,000 slaves to freedom in the first art of the 19th century. This book describes fascinating facts and fun activities your students will love! The American Milestone series are a favorite among teachers nationwide! This book includes ideas for lesson plans, hands-on activities, biographies, fascinating facts and stories. 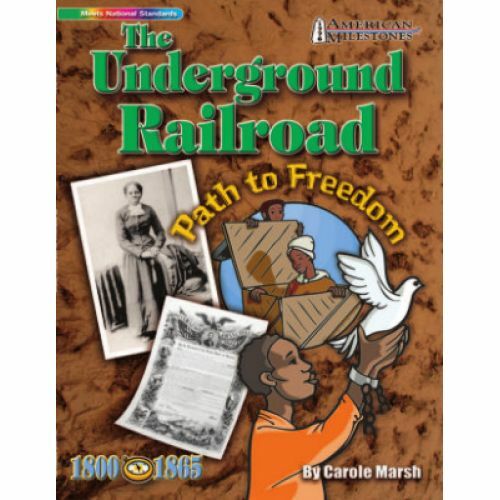 Your students will be amazed as they study the Underground Railroad. The American Milestone series meets national and social studies standards. This 28-page book is reproducible and educational.